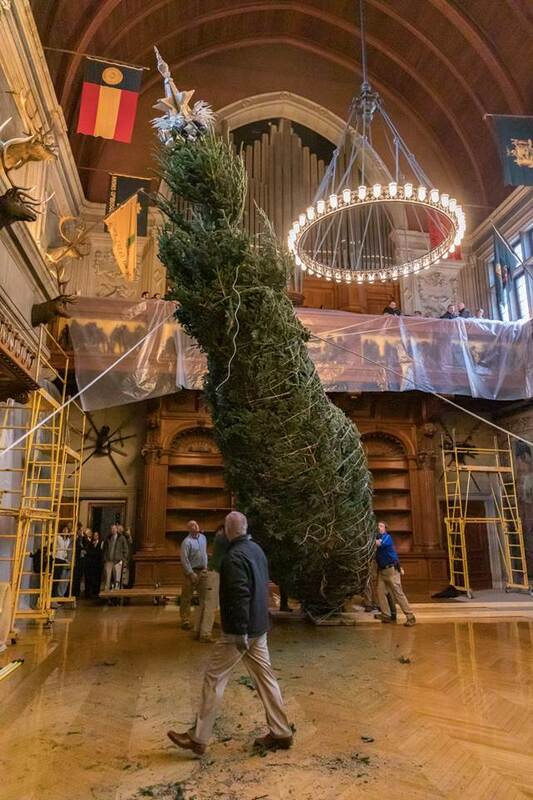 A towering 35-foot Fraser fir tree is now on display at America’s Largest Home, the Biltmore House for the holidays. Christmas at Biltmore, the estate’s annual holiday celebration, runs through Jan. 6, 2019. 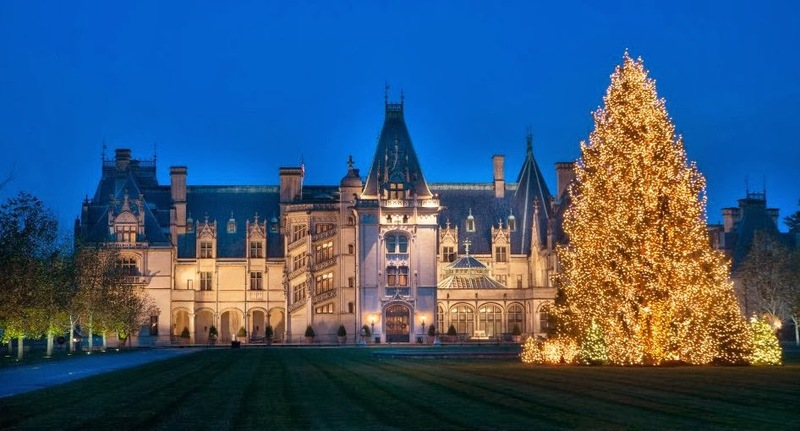 The 35-foot tree is Christmas at Biltmore’s star attraction each year. Santa Claus rode aboard a horse-drawn carriage to usher the tree to the front door of Biltmore House. It took more than 40 staff members to hoist the tree onto their shoulders and carry it into the Banquet Hall, where a system of ropes secured the tree in place. The tree comes from Andrews Nursery in Avery County, N.C. and is a nod to a tradition started by George Vanderbilt on Christmas Eve in 1895 when he opened his 250-room home to friends and family for the first time. As tradition dictates, the tree is decorated with 500 ornaments and wrapped packages tucked into its branches. It serves as the seasonal centerpiece in the home’s immense Banquet Hall. During Christmas at Biltmore, the entire estate may be enjoyed as part of admission. More than one hundred Christmas trees—each hand-decorated and styled—grace the house and estate combined. The Conservatory is filled with poinsettias and tropical plants and offers a daily complimentary seminar that provides tips for guests’ own holiday décor. Biltmore Winery is decorated with 7,000 globe-shaped ornaments suspended from the ceiling in gold and clear tones—giving the feeling of being inside a bottle of sparkling wine. Free tastings of Biltmore wines are offered among the festive décor. The 2018 Christmas at Biltmore wines are a seasonal favorite. Weekends in Antler Hill Village feature carolers sharing Christmas favorites and Santa making appearances. Antler Hill Village is a must see—buildings are outlined in lights, a fountain lit with special visual effects, and illuminated trees and ornaments in abundance. Biltmore House glows with candlelight and firelight at night, changing the daytime visit’s mood and experience. A separate ticket and reservations are required for Candlelight Christmas Evenings in Biltmore House, which run through Jan. 5, 2019. Local musicians and vocal groups perform Christmas music along the tour. Setting the scene on the front lawn is a 55-foot Norway spruce illuminated by 46,000 lights and surrounded by 35 illuminated evergreens. Luminaries line the walkway to the house. For those seeking a retreat with personalized service, The Inn on Biltmore Estate offers four-star accommodations in a private hilltop setting. .
Biltmore’s newest lodging offering is Village Hotel on Biltmore Estate, conveniently located steps away from shopping, dining, the Winery, live music in the village and outdoor activities. Savings of up to $150 are available on Candlelight Christmas Evenings packages at Village Hotel if booked through December 1. Other special holiday packages at Village Hotel are available.